Symbio were named Best New Artist of the Year at the Swedish Folk & World Music Awards 2016. 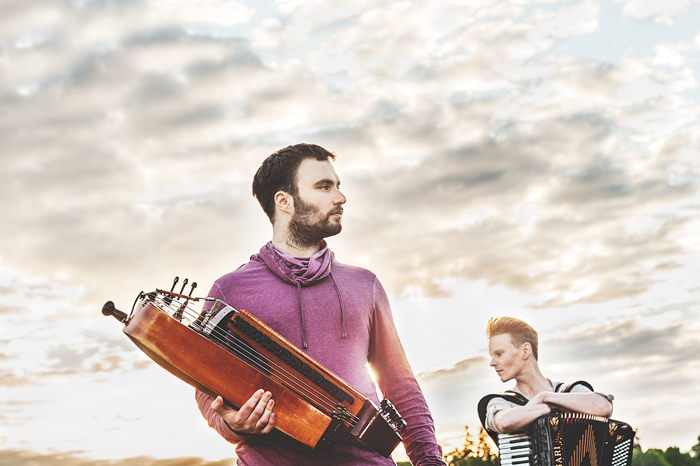 With their strong stage presence, and a magical combination of hurdy-gurdy and accordion, the duo performs in a way that you’ve never heard before, taking their audience on a moving and dreamy musical journey . Through a playful, energetic and close interaction Symbio creates new music with a warm expression. During concerts they perform with both seriousness and joy, telling personal and vivid stories about the music. The two musicians in Symbio are graduates of the Royal College of Music in Stockholm and the Sibelius Academy in Helsinki. Symbio was created in 2012 and in 2015 the duo received the Scholarship for Ensembles from The Royal Swedish Academy of Music. In October 2016 they released their debut album Phoresy and their second album will be released in late summer 2018.